St. Francis of Assisi School of Silay City faculty and staff, together with other students, faculty, parents, businessmen and professionals from Negros, attended an "inspiring" seminar entitled "I Change: Winning Disciplines for Change" by Francis J. Kong at the University of St. La Salle Bacolod last September 22, 2012. Tapulanga Foundation, Inc. was one of the seminar's beneficiaries, together with the Kalipay Foundation Scholarship Fund and One La Salle Scholarship Fund. Other speakers were Alex Lacson (Faith in the Filipino), Yeng Remulla (On Starting Something) and Lois Yasay (Starting a Passion Revolution) who were also applauded for their inspiring sharing. The crowd was given the task to make a survey of the things, traits or habits that they want to change and they want to achieve. It was an avenue in gaining tips and techniques establishing DISCIPLINE within Filipinos. Francis J. Kong emphasized that “good people do not retire, they refire” which inspired all especially the SFAS attendees. 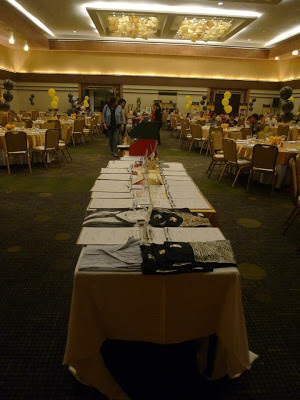 Sharing Hope 2012 MD - Thank You for your support! 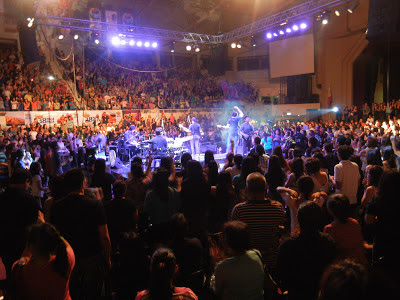 Our heartful thanks to our guests last week at Sharing Hope 2012. 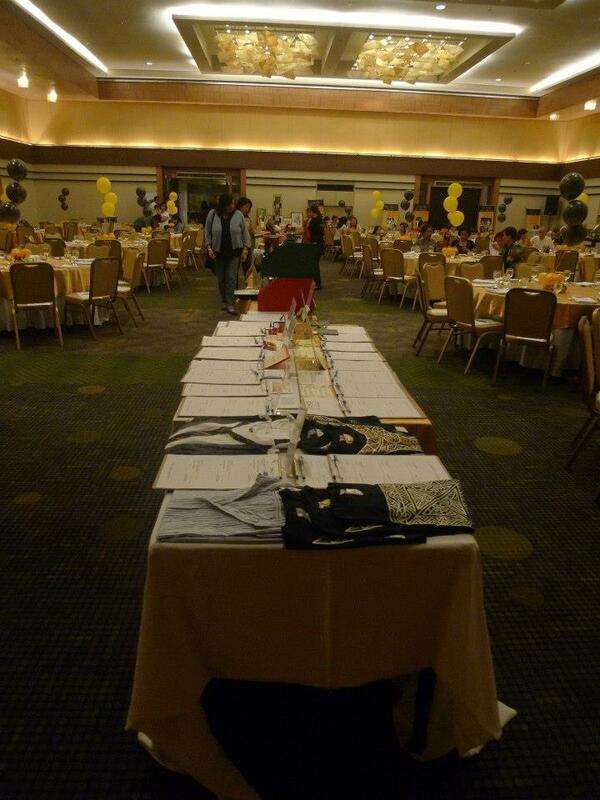 We had about 130 guests at Kahler Hall in Columbia, Maryland. 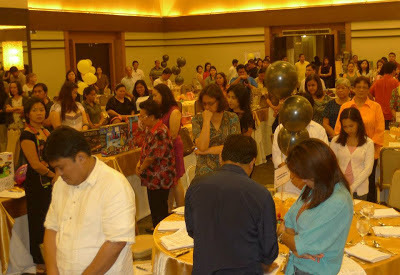 Our event started promptly at 5pm and we ended the silent auction shortly before 8 pm and picked the winners of our raffle. Marcella Glasgow won the iPad, Bryan Teague won the Microsoft Surface tablet (to be delivered when it comes out in a few weeks), and Cindy Kolodziejski won the Google Nexus table. We couldn't have done this without everyone's support including those who weren't able to join us that evening but still sent in their generous donations and bought raffle tickets. We hope many of you will join us again next year. Together with all the pledges we received, we raised more than $17,000. 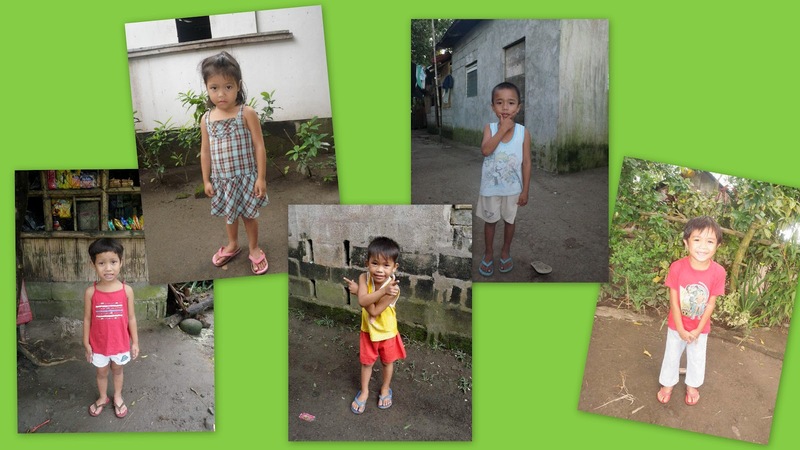 Thank you for these blessings to support our programs in the Philippines. 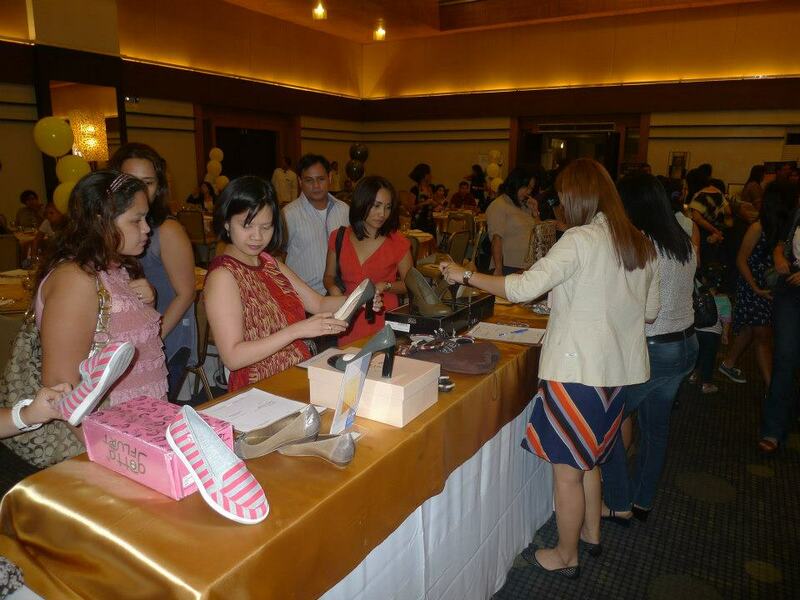 Thanks to Mari Abello for the wonderful pictures from the event. Here's a video we showed at the event showing students in their various activities at SFAS. And here's a video taken during our presentation. North Star (from Fort Washington) provided the catering and the desserts were made by Margie Abello and Chrissy Jardeleza. Our menu for the evening was Lechon (Roast Suckling Pig), Pork and Chicken barbecue, Chicken Adobo, Lumpia Shanghai (pork), Vegeteble Springrolls, Bijon and Sotanghon noodles, Mongo (Beans) with Spinach (vegetarian), Beef Caldereta (with carrots, red peppers, peas and potatoes), Fried Plantains, Mango Pastel, Pili Squares, Cassava Cake, Leche Flan, Meringue, Fried Rice and White Rice. Thank you to our sponsors, Akubo, Teresa Hoffman MD & Associates, Design Essentials, Susan Clack, LB Hand Therapy, Randy and Renee Reyes, Law office of Ria P. Rochvarg, and Law office of Katherine Taylor. Thank you to all our silent auction donors --- Margie Abello, Mari Abello and Lisa Kornerup, Jack and Madeleine Castro, Susan Clack, Clyde’s Restaurant, Coventry School for Dogs, Midge Crystle, Custom Media Options, Melinda Derrick, Ellicott Mills Brewing Company, Karen Gerald, Ramon and Marianne deGuzman, Ging and Michael Graham, Pat Hiban, David Hobby, John Hossli, Neal and Virginia Jarvis, Leelyn’s Restaurant, Maryann Laing, MD Dermatology of Maryland, Robert McAllister, Kathy Miller, Jackie Panowicz, Percworks, Scott and Judy Pelletier, Pub Dog, Jose Raymundo, Joanie Reisfeld, Lia Ridout, Faith Riggs, Alvin and Babsie Sanico, Sarah Sauder, Steve and Becky Sauder, Molly Scheufele, Frankie Schwenk, Joanne Serelis, Aaron and Meghan Sommers, Bob and Sue Strauss, Michelle Taylor, and Toby's Dinner Theatre of Columbia. For over 10 years of granting educational assistance, Tapulanga Foundation has inspired students in gaining quality education, especially in St. Francis of Assisi School of Silay City. Two graduating high school scholars, RJ Navigar and Jean Mate, continue to have a chance at better lives because of Tapulanga Foundation. Aside from receiving financial benefits for school-related expenses, Tapulanga Foundation scholars have been treated to free summer workshops, medical benefits and enriching field trips. RJ and Jean have been attending two summers of hip-hop dance workshops and RJ has attended two acting workshops as well. Both come from financially-challenged family backgrounds. RJ’s mother works for ten years already at SFAS and is presently Preschool In-Charge and assistant to the Vice Principal while his father is a farm worker. His brother (an SFAS alumnus) is now in 2nd year college (with a college scholarship) and his younger sister is currently in Grade 1 (also at SFAS and a Tapulanga Foundation scholar). Jean’s mother is an office clerk while her father works as a sales agent for a telecommunications company. Her brother (an SFAS alumnus and sports scholar of TF) is in his 2ndyear at LCC-Bacolod. How long have you been Tapulanga scholars? RJ: It’s been 11 years since I was in Kindergarten. Jean: I’ve been a Tapulanga Scholar since 2010, when I was in 2nd year High School. How is your senior year so far? RJ: I’m sad to think about it, but that’s life. 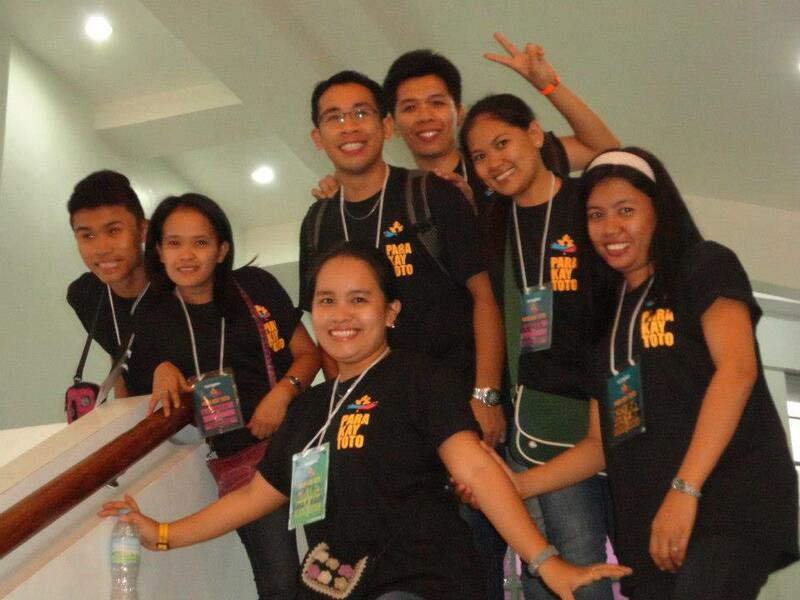 We (my batchmates) are enjoying our time together. Jean: My Senior year has been so busy so far. But still, I’m enjoying it as it is my last year being a Franciscan. What are your feelings as this is your last year in SFAS? student, enhancing my skills and developing my individuality. Jean: As this is my last year in SFAS, I am cherishing my 2nd home and bonding more with my classmates. What are your plans/dreams after SFAS? RJ: I’m planning to take up Bachelor of Secondary Education, Major in MAPEH (Music, Arts, Physical Education and Health). I want to pursue it at USLS (University of Saint La Salle) or CSA-B (Colegio de San Agustin-Bacolod). Jean: After graduating, I plan to take up either Tourism or Mass Communications. I am hoping to enroll in LCC (La Consolacion College) or USLS. What message can you give to the Tapulanga Foundation? RJ: First and foremost, thank you for making me a scholar at SFAS. It has been my “cocoon” (for 11 years), but time will soon come that I will spread my wings like a butterfly, ready to soar high in my life. I will try my best to return and help my fellow Franciscans too. 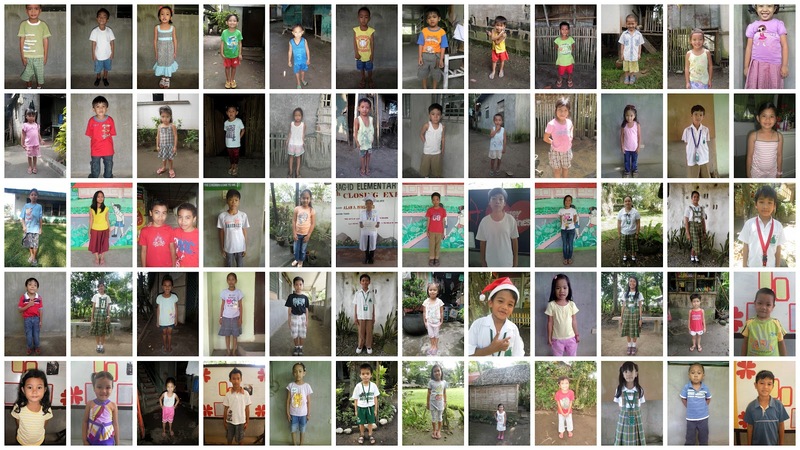 Jean: I’m really thankful to Tapulanga Foundation because they shouldered all my school expenses the past three years. It has been a big help for me and my family especially that we lack the finances. 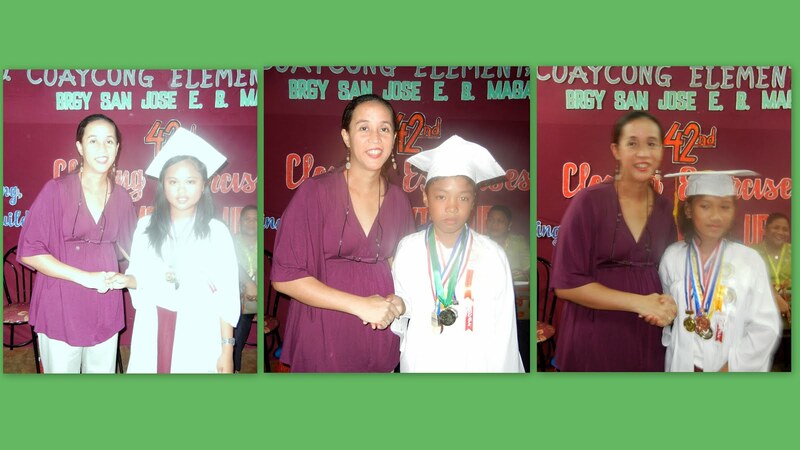 I also thank my sponsors because they believed that I can get high grades and I am worthy to become their scholar. With high hopes, the foundation, as well as the school, sees bright futures for these two scholars. Hopefully, the two will be granted scholarships when they will enter college, allowing them to continue exploring their infinite possibilities and reaching their dreams. It was only three years ago that Mrs. Ruby Barnuevo was still a struggling food vendor in Hacienda Lugway, Silay City. Although cooking was her passion, she struggled to make ends meet for her family. Today, she owns a stall in the canteen of St. Francis of Assisi School of Silay City (SFAS) with the help of Tapulanga Foundation’s micro-credit program. “The food business has always appealed to me. With the micro-credit loan of the foundation, I don’t have to worry that much about finding capital for my business.” said Mrs. Barnuevo, 43 years old. She lives in Hacienda Lugway, with her husband, Judy and their five children: 3rd year high school student Kyle Dominic, 4th grader Kara Fraancheska, 2nd grader Kier Vincent, and pre-kinder Jude Bryan – all students of SFAS and scholars of the Tapulanga Foundation. The low interest rate of 1 percent a month and after two months she is able to renew her loan again makes her livelihood easier and more stable as she always has ready capital for her business. She plans on adding a new livelihood project since her current business is going well. “I would like to go back to raising pigs since we already have a pigpen at home.” adds Mrs. Barnuevo. Like the other beneficiaries, micro-credit allows her to support her family and eventually make a difference in her community. 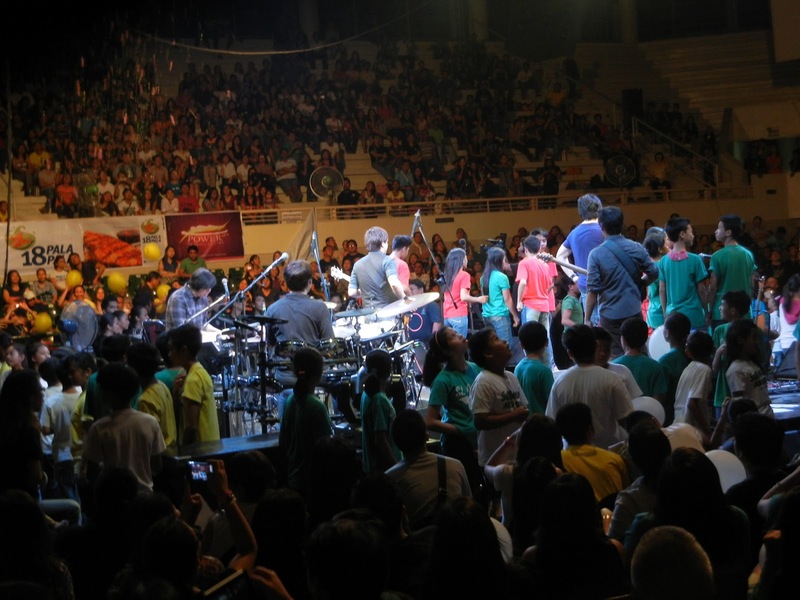 Eight months have passed when Typhoon Sendong devastated the city of Iligan and claimed so many lives. This is the story of a family who lost not just their house and their source of livelihood but also family members whose bodies remain unrecovered until this very day. 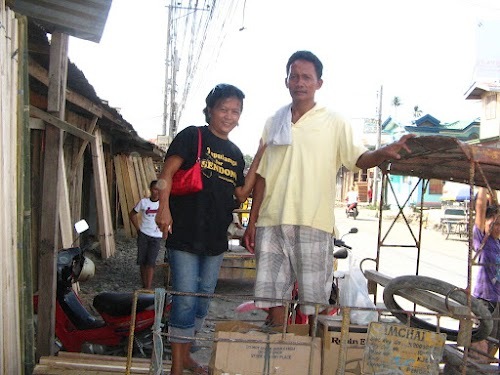 Eddie and Excelenia have seven children and all of them lived in Purok #5, Bayug, Iligan City. Their eldest daughter, Edeline, who was married to Mc Jayson Ferolino for nine years and blessed with two sons, Mc Jayssin who was 9 years and Mc Jayvance who was 6, was five months pregnant when the tragedy transpired. This is their account. On the night of December 16, 2011, it started to rain. They thought of it as the usual rain that will just stop in a couple of hours so the family retired to sleep past 9:00 p.m. Around midnight, Edeline and Mc Jayson were awakened by a strong banging on the door (by their parents), alarming them to evacuate as the water in the nearby river overflowed. The grandparents, together with Edeline's family, their other children and grandchildren, evacuated to higher ground unprepared. Having no flashlights or any flotation device, they were just dependent on each other as the water rose up from their knees to their chest. The strong water current sent some members of the family to other directions. Eight of them found themselves on the roof of a relative's house. When the house started to collapse, the entire family managed to climb on a coconut tree beside the house while the others held on to a mango tree. But even the coconut tree was unable to stand the raging waters. The consequent downfall of the tree sent the family in disarray. They were all scattered, each trying to survive. The matriarch, Excelenia, lost her grip on the coconut. She was the first one who fell off the tree together with her other grandchild who managed to cling to her even underwater. Knowing that she can't swim, her husband Eddie swam after her, not knowing if he could still find her in the dark. It was pitch black but he was able to grasp his wife's foot and was very thankful that along with his wife was their 3-year-old grandchild, John Dave, still holding on to her grandmother's leg. There was a lot of screaming and crying everywhere – asking for help. The pregnant Edeline was thrown into a pile of logs. Somewhere in the darkness, she can hear one of her child screaming for help, calling her. She was repeatedly hit by "so many debris" as she recalled, mostly branches of trees and even logs. That was the last memory of her dear family as she lost consciousness. It was already morning when she regained consciousness. A neighbor found her and helped her. 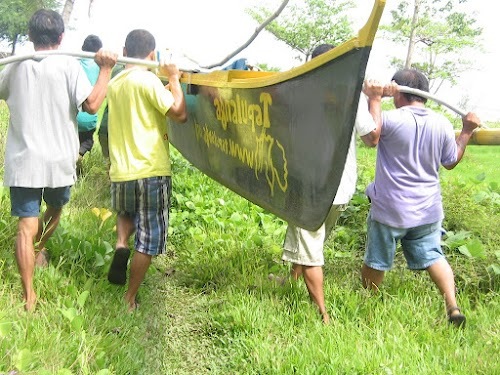 Two of the children of Excelenia and Eddie were swept by the current to other barangays. They were only reunited in the evacuation center days after. She lost one of her grandchild from her other daughter, Sarah. Edeline, unfortunately, lost everyone in her family, her two kids and her husband. Just like what happened to "Ampil" who is her uncle, Edeline, also sank into depression, refusing to eat for months and tried to bury her agony by sleeping. Worried of her daughter and her unborn child, Excelenia and Eddie tried their very best to lift up Edeline's spirit in the midst of very uncomfortable living conditions in the evacuation center for several months as they are awaiting still for their permanent relocation. Last April 27 of this year, despite all odds, Edeline Lacuna Ferolino gave birth to a 6.14 pounds bouncing baby boy named Mc Jayson Jr., after the name of her late husband. It was an agonizing normal delivery that almost caused Edeline her life. Her blood pressure rose up while she was in labor and the baby was actually overdue so she had to be induced. Thinking of their financial constraints, she strived so hard for a normal delivery still. The sight of her son, the only tangible reminder of her spouse made everything bearable now for Edeline. Just last month, July 1, Mc Jayson Jr. was baptized in the Catholic rites attended by family members, one of which was Galfer "Ampil" Lasmarias who stood as one of the godfathers and is also one of Tapulanga Foundation's beneficiaries. Excelenia, Eddie, Edeline and the rest of the family are so grateful for all of the help that the Tapulanga Foundation has readily extended to them through all the foundation's benefactors. Having received a motorized "pump boat" is like giving them another chance in life. 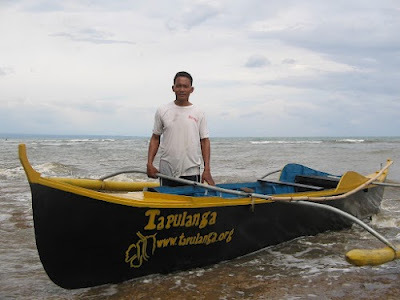 As a fisherman, Manong Eddie's simple dream is to be able to feed his family with his own hands without asking financial assistance from others. Now that he has the fishing boat and fishing net which he made himself, they can now get back on their feet. Also, the financial aid given for Edeline's delivery is something that she can never forget for the rest of her life. Thank you very much to you all! God bless you all dearly! 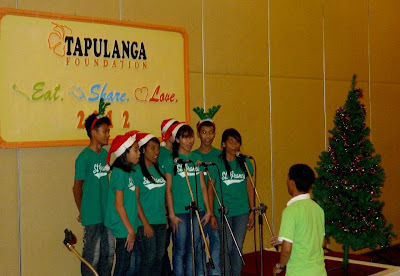 This school year, 2012-2013, is another year of fulfilment for the Tapulanga Foundation as it continues its legacy of educational support to its 260 scholars at the St. Francis of Asisi School of Silay City. This year's Pre-Kinder scholars exclaimed how they want to be doctors and teachers in the future. “Thank you to my donors,” a smiling Donna Grace Duremdes, Grade 1, said as she shared how she received school supplies from the Tapulanga Foundation in May before classes started. Geno, one of the delos Santos twins in Grade 7 says, "I feel blessed because someone is actually supporting me." Summer activities are conducted every year and Grade 8 student, Caroline Deriada, finds herself lucky for being one of the scholars to enjoy such events. Some scholars have the following message to the donors of Tapulanga Foundation. The world is a beautiful place, and it may be good to enjoy it with eyes closed, as we relish all kinds of sounds and sensations. But it would be a lot better to enjoy it with eyes wide open. And with clear vision. These three lucky people got a chance to truly appreciate it, with clearer eyesight. Read their stories below. One day in the month of October of 2011, 4-year old Nica Galvez, while playing inside their house, got into a fight with her brother. Her brother threw a pair of small scissors towards her, which accidentally hit her right eye. She and her parents went to see a doctor the next day and it was discovered that there was an injury in her eye and she needed to have an operation. With the help of the Tapulanga Foundation, they were able to go to Corazon Locsin Montelibano Memorial Regional Hospital in Bacolod City for consultations, laboratory exams and even transportation and meals for free as even these two the family could not afford. Little Nica finally underwent surgery in February of 2012. Angelo Singson is a thirteen year old high school student of the St. Francis of Assisi School. Angelo loves to read books like Harry Potter’s Sorcerer’s Stone and likes to draw, too. His eye problem started when he was 11 years old. He couldn’t see well if he covered his right eye. He went to see a doctor and it was discovered that he had cataract in his left eye and he had to undergo surgery. He was referred to the Rotary Foundation, which screened candidates for cataract operation at the Riverside chapel. With the financial support of the Tapulanga Foundation, Angelo was able to travel to Riverside Hospital in Bacolod City, undergo surgery for about an hour there, and acquired medicine (eyedrops) needed for his eye, and go back for checkups. He underwent surgery very recently (in the month of May 2012). Ms. Yvette Jaranilla is a new teacher in the high school level in St. Francis of Assisi School. Ms. Jaranilla sensed a problem with her vision when she was 18 years old and still in college. She had a hard time reading what was written on the blackboard. And her vision was starting to become blurry. She left it alone for a while until it came to a point when about three years later, she had a hard time recognizing faces. She eventually had a check-up just recently and the doctor discovered she had cataract in the right eye and another was starting to develop in the left one also. But the doctor did not advise operation because the cataract wasn’t mature enough yet. So she was advised to wear special eyeglasses with thick lenses to improve her vision. With the help of the Tapulanga Foundation, she was able to acquire free eyeglasses. When asked how she felt after putting them on, she gave a big smile and said, “It feels good to have eyeglasses.” She has been using them for a month now and sees a lot more clearly. She added that she thanks God and the Tapulanga Foundation for an answered prayer because she got the pair of eyeglasses that she really needs. 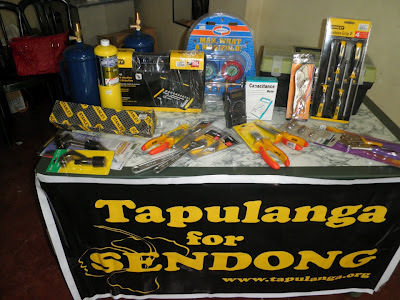 Tapulanga Foundation launched the Special Appeal for Sendong-Rebuilding Homes and Livelihood Assistance last January 2012. This appeal aimed to raise funds for the victims of the typhoon. We are sharing with you a report of the first beneficiary who was given support to make a living for himself and at the same time, rebuild his future. The first part of the article showed Ampil's life before the faith-challenging event (see http://tapulanga.blogspot.com/2012/06/tapulanga-for-sendong-story-of-ampil.html). In the second part we share how this event that changed his life forever. Ampil was living a simple life with his family in Iligan City, located in the southern part of the Philippines. 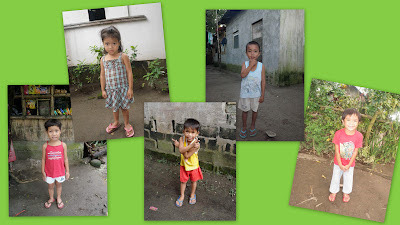 In the morning of December 16, 2011, Ampil’s children were very much excited for the yearly Christmas party in their community. His children, Ferlie and Galfer, Jr. were talking about Christmas gifts and songs that they were going to sing. His wife, Julie, who was then the Purok Treasurer, had already collected the money intended for the said party. In the afternoon, the children enjoyed playing with their cousins. At 5 p.m., his kids happily welcomed him and beaming with smiles as he just bought a new dvd player. Around 8 p.m., the family enjoyed testing their new player as they happily sang Christmas songs even without a microphone. Galfer, Jr. enjoyed the most as he even refused to sleep until the family went to bed past 10 p.m. already. At around midnight, Ampil’s family was awakened by a great pounding on their wall and someone yelling, “Wake up! The river has overflowed!” The water was already up to their knees so they hurriedly went to his in-law’s house which was not far from theirs. He even went back and tried to save whatever he could from the flood, moving up his appliances to higher areas in the house thinking that the flood would not be that strong. Soon enough, he realized that it was futile. He went back to his in-law’s place thinking that his whole family was still there. He was told by his wife’s uncle and aunt that Julie (Ampil’s wife) and his daughter transferred to his cousin’s house nearby. Finding their way in the dark with only a few people having flashlights was very difficult. With his son, they tried to follow the others but was unsuccessful because the water was already chest high and the current was very strong. Voices of children and adults could be heard all around asking for help. They sounded powerless over the monstrous water. His 3 year old little boy was in his arms crying, when the water rose up to cover the roof where they had climbed up to. While he struggled to keep himself alive for his son, the fear of losing him kept him strong and hopeful even as they were both swept into the open sea. He had witnessed the voice of his son slowly fading away. He did not lose his grip on his son even when the boy wasn’t talking to him anymore. He was thinking, “Junior might be dead. Nevertheless, I will not give up on him.” In the dark of the night, Ampil tried to resuscitate his son on top of a log. Not long after, they were swept again by the raging water. He lost his grip on his son’s lifeless body. He tried to swim under the water and recover his son but to no avail. Logs and other unknown debris hit him everywhere in his body and almost cost him his very own life. His body was literally black and blue when he was rescued. Losing everything that you have is painful but facing the reality of death of your whole family was just too much to bear. There wasn’t a day in the months after that Ampil was not crying over the death of his family. He made every effort going from every morgue, hospital, and other places, in and outside of the city just to find the bodies of his wife, daughter and son. To be the only one alive in his family left him so guilty of being alive and breathing. There is no amount of words that we could utter to ease his pain but it is only through the grace of God that Ampil is now moving on with his life. Ampil may not have fully accepted the fate of his family yet, but one thing is for sure, when he received the tools and equipment that Tapulanga Foundation gave him, a smile was brought to his face that his family has not seen after the tragedy. With the tools, he is now slowly regaining a happy disposition in life. He has been accepting repair jobs to keep himself busy. As of now he is still pre-occupied with the paper work for his family's death claims. He dreams that once he has a stable job, he could save enough money to go abroad and become an overseas worker. He believes working abroad could somehow relieve his painful past and help rebuild his family's future (parents/siblings), for them to move on also. To all the donors of the Special Appeal for Sendong-Rebuilding Homes and Livelihood Assistance, thank you so much for your generosity and prayers as well. This is an article in two parts. The first part will show us the life of this man before the faith-challenging event occurred in his life. The second part will describe how he went through this challenge and got through it at the end. This is a glimpse of the life of Ampil before Typhoon Sendong hit the place that he lived at the most joyous time of the year. Iligan City, located in the southern of the Philippines, was submerged in water. An alarming number of lives were lost, some of whose bodies were never recovered. Galfer Hora Lasmarias, also known as “Ampil” is a 30 year old refrigeration and air-conditioning technician. He got married to Julie Rina Kundiman 12 years ago (June 2000) when she was 29 years old. They've been blessed with two beautiful children --- Ferlie, who had been 10 years old and in her 4th grade and Galfer Jr. who had been 3 years old. They enjoyed living a simple life in their own house situated in Bayug, a small island within the vicinity of Iligan City. Coming from a close-knit family brood of 13, Ampil valued his family more than anything else. He knew how to persevere in times of great need. Being the breadwinner, he was a hardworking father, devoting all his time to his dear family and to his work. He earned a meager salary of P6,000 a month. 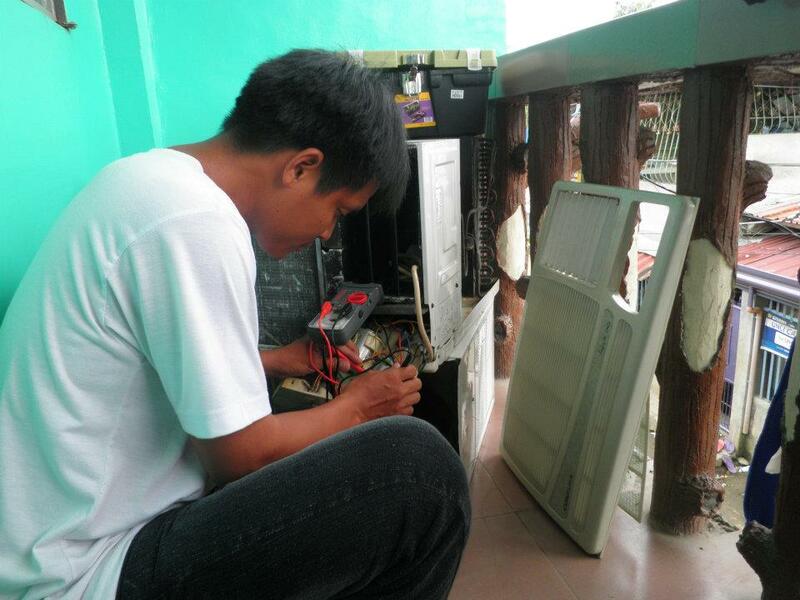 To sustain his family, he made sure to do extra work or “sideline” even if it meant doing it on Saturdays and Sundays, repairing broken refrigerators and airconditioning units which gave him an extra income of P4,000 to P5,000 a month depending on his clients’ generosity. Everything had been going well for him, it seemed. He was already contented with what he had: a loving and supportive wife, two precious kids, a roof over their heads, and a steady income enough for them to live a decent life. But everything in his world turned upside down in the early morning of December 17, 2011 when Typhoon Sendong hit the city, flooding the whole island where they lived. In the morning of December 16, the day before the devastating event changed the course of his life, his children were very excited about the upcoming yearly Christmas Party in their community. Ferlie and Galfer Jr. were talking about Christmas gifts and songs that they were going to sing. Julie, who was then the Purok Treasurer, had already collected the money intended for the party. Nothing unusual happened that day. In the afternoon, the children enjoyed playing with their cousins. At about 5 pm, his kids happily welcomed him and beamed with smiles because he just bought a new “DVD Player,” which they could use to practice singing their Christmas songs. At 5:30 pm, Galfer started waxing the floor of their house. At around 8 pm, the family enjoyed testing their new player. They were happily singing Christmas songs without a microphone. Galfer Jr. must have enjoyed the most because he refused to sleep at around 10 pm. He wanted to watch more of the background scenes in the songs. Eventually, the family retired to sleep at past 10 pm. 35 Scholars in 35 Days Challenge - Another Success! It is with great pleasure to report to you that four days before the campaign ended, we were able to reach not only 35 scholars but 60 SCHOLARS! Thank you to all the donors, some of whom we welcome as new donors to the foundation while others are existing donors already who have decided to be more generous by adding another scholar/s to help! Our new donors come from 6 countries all over the world: U.S.A., Luxembourg, Dubai, Australia and Switzerland and of course, the Philippines. The new school year opened last Wednesday, June 6, 2012 and all of these kids were very excited and proudly went to school ... thanks to YOU for making this possible!